Animals have adapted to many different climates all around the world. In temperate deciduous forests, animals have had to evolve to adjust to the changing seasons. To survive the cold winters, most of the trees in these forests lose their leaves in the fall and go dormant in the winter. Animals may store food for the winter, hibernate, or migrate in order to survive. These forests can be found in eastern United States and Canada, western Europe, China, Japan, and parts of Russia. Small pockets can also be found in Australasia and southern South America. Incorporating art projects into a lesson plan about temperate deciduous forests is a great way to make learning fun. Using recycled and waste materials such as newspaper, egg cartons, toilet paper rolls, plastic bottles, and CD’s can make these projects more eco-friendly. Turtle species such as wood turtles and box turtles, snapping turtles, and musk turtles live in temperate deciduous forests. They hibernate in the winter, either deep under water or in a burrow. The European red squirrel is common in deciduous forests in Europe, and the gray squirrel is common in deciduous forests in eastern parts of North America. These squirrels store food such as acorns for the winter. While they do not hibernate, they do spend a lot of time in their den during colder months. The color and thickness of their coat also changes throughout the year, depending on the season. The eastern cottontail rabbit is one of the most common rabbit species in North America. As an herbivore, they prefer green vegetation and can thrive in the clearings and edges of deciduous forests. Hedgehogs are primarily nocturnal, taking shelter from predators under bushes, rocks, and in dens. While all hedgehogs can hibernate, only those that live in colder climates need to. Snakes such as the common garter snake, timber rattlesnake, black rat snake and the northern copperhead live in temperate deciduous forests. They feed on birds, rabbits, and rodents that share the same habitat. While they are inactive in the winter, they do not hibernate. While opossums are typically nocturnal, in the winter they may forage during the day when it is warmer. They also spend most of their time in the winter in dens lined with grass and leaves. The duckbill platypus is a semi-aquatic mammal. They live in streams and rivers in the temperate deciduous forests and tropical rainforests of Australia. The bald eagle is the second largest bird of prey, and is only found in North America. In very cold climates, they will migrate south for the winter. Cardinals are song birds that primarily eat seeds. Only the males have the iconic bright red colored feathers. They do not migrate in the winter. Badgers can be found in temperate deciduous forests in Asia, in addition to other habitats such as deserts and mountain areas in parts of Asia and Africa. To survive cold winters, their fur grows longer to keep them warm. Many species of owls live in temperate deciduous forests. All owls are nocturnal, and some migrate south in the winter. Red foxes are a common fox species that can live in temperate deciduous forests. Their fur grows longer in the winter to help them stay warm. While they sometimes find a den to hide in, they typically curl up and sleep in the open. The white-tailed deer is a common deer species often found in temperate deciduous forests. The color and thickness of their coat changes depending on the season. Each spring, the males grow a new set of antlers. Both black and brown bears can thrive in deciduous forests. They dig dens to hibernate in during the cold winter months. Brown bears eat as much as 90 pounds of food per day to prepare for hibernation. 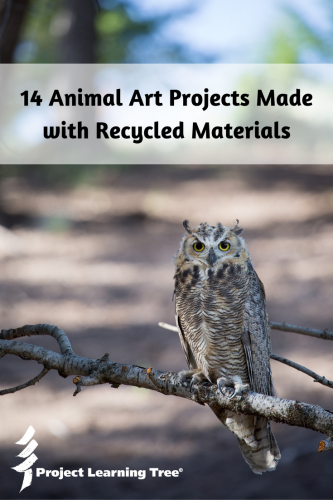 See all of the animal art projects made with recycled materials on this Pinterest board. Which art projects are you going to try? What are your favorite recycled materials to use in your classroom?